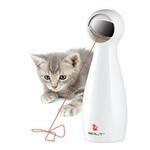 FroliCat Bolt Interactive Cat Toy is an automatic rotating laser light that provides hours of fun for your feline and canine friends. The FroliCat BOLT is laser fun for felines and owners. Endlessly entertain even the laziest cat with automatically-generated red laser patterns. Simply hold BOLT in your hand or place it on a flat surface, turn it on and watch your cat pounce, chase, and bat at the exciting laser patterns. Use it in automatic mode where it generates random patters or in manual mode where you can control the action. The laser automatically shuts off after 15 minutes in either mode and also includes a manual on-off switch. *Requires 4 AA batteries, not included. Warning. Laser Pointers: Selling or giving a laser pointer to anyone 18 years of age or under is prohibited by New York City Law and punishable as a misdemeanor. NYC Administrative Code, Sec. 10-134.2. LOVE this site! I recommend this site to everyone I know!